Ultimate Cleanse continues to be the "original & only" clinically formulated and clinically researched complete internal body cleanser on the market. Episodes of bloating, brain fog, sluggishness, chronic constipation, slimmer than normal stool, seeing undissolved med or vitamin capsule in the toilet water, 1 bowel movement per day or more concerning 1 every 2 days (normal is 2 to 3 times a day) or low vitality are signs that you may benefit from a supportive internal cleanse. For many people, participating in a cleansing program multiple times a year is part of an overall health plan, just like regular exercise or taking a multivitamin. WHAT OCCURS DURING THE BODY'S NATURAL CLEANING PROCESS? Subtle improvements - extraordinary results. Ultimate Whole Body Cleanse has changed the live of thousands of people, through its comprehensive MULTI-HERB Digestion & Detox Support and MULTI- FIBER Colon Cleanse formulas. By cleansing and toning all channels of elimination (the bowel, liver, kidneys, lungs, skin, and lymphatic system), digestion and all other bodily functions can be rejuvenated back to normal functioning. Ultimate Cleanse is 100% natural and contains the purest blend of herbs and fibers that gently sweep away wastes and toxins. Address The Deepest Core Of Health. The 26 feet of the digestive system and colon keep us young, strong and energetic. It is where nutrients are extracted and absorbed from food, lending life and good health to the entire body. Unfortunately, this system is also the most abused. We've been raised on a diet of bread, dairy, cheese, meat, sweets, candy, ice cream, and fast, fried, and fatty foods. Over time these foods contribute to sluggish and inefficient digestion and elimination of toxins and waste from the body. When toxins and wastes accumulate, due to poor digestion and elimination, the window is open for them to be reabsorbed into the blood stream and pollute the tissues and organs of our internal bodies! This process, called "autointoxication", is thought to be the impetus for many problems, including fatigue, gas, bloating, poor skin, brain fog, and low-blood sugar. Fortunately, thanks to nutritional science and the work of clinical herbalists, there is a safe and natural way to cleanse the entire body of toxic build-up and rejuvenate the digestive system. Gold Medal Vity-Award winner for the last 3 years in the cleansing and detoxifying categories. Addresses all channels of elimination: bowel, liver, lymphatic system, kidneys, lungs, and skin. Part 1: MULTI-HERB Digestion & Detox Support, featuring 29 powerful cleansing herbs that stimulate the cleansing and release of toxins and poisons trapped in the body from poor dietary habits and environmental pollutants. 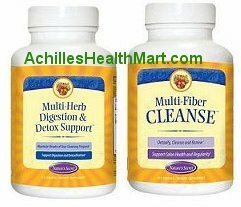 Part 2: MULTI- FIBER Colon Cleanse, featuring 13 fibers and herbs that aid in stimulating bile and peristaltic action, while sweeping, cleansing, and toning your digestive and eliminative systems. The original and only clinically formulated and clinically researched complete internal body cleanser backed by 30,000+ hours of nutritional expertise. Absorption and harmony In addition, Ultimate Cleanse is formulated with specific "harmonizing" herbs and botanicals that increase absorption and act as catalysts, so that the ingredients work as a "symphony" together, providing long lasting benefits. Precision, care, and research Ultimate Cleanse was designed under the expertise of world-renowned naturopath who's formulations have become world famous due to their amazing effectiveness and natural ingredients. Instructions: MULTI-HERB Digestion & Detox Support and MULTI- FIBER Colon Cleanse were designed to be taken together in the morning and evening. Start with 1 tablet of both products in the morning and 1 tablet of both products in the evening, increasing intake of both products by 1 tablet every other day until you achieve 2 to 3 bowel movements per day. Once you find the correct number of tablets, you can continue with that amount for enhanced internal cleansing. Do not exceed 6 tablets of each product twice per day. Take only as much product as is needed to achieve 2-3 good bowel movements per day. Drink 8 to 10 glasses of water per day. For best results, follow the enclosed cleansing booklet. The End Benefit: You'll feel lighter, better, more energetic, and healthier! You may notice enhanced digestion, better elimination, healthier hair, skin & nails, brighter eyes, increased mental clarity, heightened enthusiasm and vitality, and much more. Cleansing your internal body is like giving yourself an "internal tune-up"! Every body part seems to work better! "...Ultimate Cleanse my #1 selling cleanse formula in the U.S.A., International and with U.S. Military Personnel stationed world-wide." I've been testing different cleanse formulas since 1996, and have found the Ultimate Cleanse to be the best so far for over-all cleanse of key body organs. My customers seem to agree because they have made Ultimate Cleanse my #1 selling cleanse formula in the U.S.A., International and with U.S. Military Personnel stationed world-wide. It's very gentle and you will notice an improvement in the way you feel within the first week. I use the Ultimate Cleanse Program at least 3 times a year. Also, because I get this question a lot, for those that are starting out on the Ultimate Cleanse and Achillian Ultimate-9 for the first time, *may* experience a stronger than normal detoxification for the first 24 to 48 hours. So, I always suggest using the Ultimate Cleanse (cleanses your bowel, lymphatic system, kidneys, lungs, liver and skin) for at least a week before starting the Achillian Ultimate-9 (cleanses/detox and rebuilds your cells), with plenty of good water to help flush the toxins out of your body. Thank you for your business, and here's to a new and healthier you! "I've payed twice the amount at other stores!" Comments: Thanks for the great prices! I've payed twice the amount at other stores! I'm glad I found you. "second time ordering working well..."
Comments: The product works great! By the way, you don't have to send me the audio CD's since I have them already. Comments: I LOVE THE PRICE, I PAID 29.95 FROM MY LOCAL HEALTH FOOD STORE. REST ASSURED I WILL ORDER FROM YOU GUYS AGAIN. THANKS!!! USA customers limit 4 units per order please - International customers limit 2 units per order. Ultimate Cleanse prices subject to change here without notice. Achillian Ultimate-9, our third generation procaine formula with a patented breakthrough that provides a 100% procaine complex factor (100% procaine is active 6 to 8 hours, instead of 48 minutes or less), utilizing the same 100mg of Procaine HCl in the famous Dr Ana Aslan's Gerovital H3 (15% complex factor) without the use of allergen preservatives. Discover for yourself why over 35,000 Gerovital GH3 clientele have already switched to this patented breakthrough. 1999 Gold Medal Vity-Award winner! Liver Cleanse -Formulated with 19 herbs, including Milk Thistle, which work synergistically to cleanse the liver of harmful toxins, while promoting the recovery and rebuilding of the livers delicate cells and tissues.